JOIN THE BEAUTY BLOG! 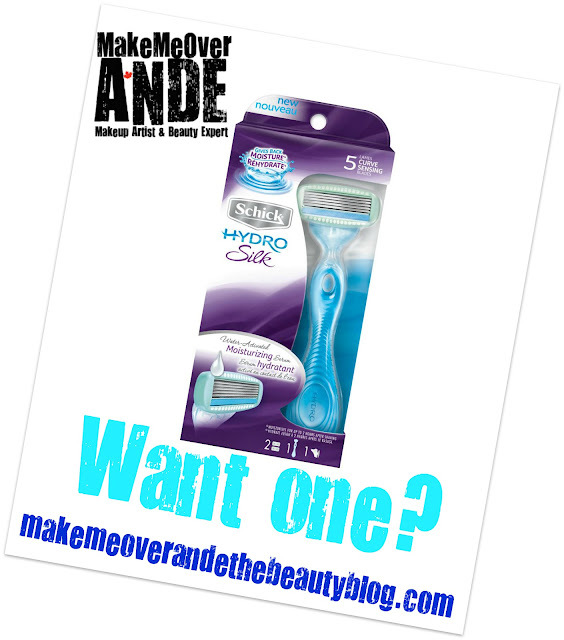 CLICK ON "JOIN THIS SITE"
Now why do you want to a Schick Hydro Silk Razor?? Because...You want smooth legs! You will get hydrated legs! You will experience unique skin guards that will help protect your skin! Because....You will shave with a moisturizing serum infused with marine extracts! You want silky smooth skin after you shave! You want curve sensing blades that will give you incredible closeness!! OK, so those who know me I am a little sensitive to pain, therefore, I DO NOT WAX! I ONLY SHAVE! and when I was approached by the Schick Hydro Silk Razor people to try out this new razor, of course I said yes! So now we get a little personal.....so I tried this out on my legs and underarms. I loved it! The convenience of having the serum strip attached to the 5 blades is wonderful! For those ladies out there that shave, you know that once in the shower and you have a shave gel, your hands get all slippery and you eventually reach out for your soap. Soap totally dehydrates your skin! So having this serum surround the blades is genius! SO, IF YOU ARE ONE OF 25 PEOPLE TO LIKE SCHICK ON FACEBOOK AND JOIN THE BEAUTY BLOG, YOU WILL RECEIVE YOUR OWN SCHICK HYDRO SILK RAZOR! Don't forget to write your review on the Schick facebook fanpage! GIVEAWAY CLOSES MARCH 9TH 2012!